The Inflammation Research Foundation (IRF) funds clinical research to demonstrate the ability of anti-inflammatory nutrition to reduce the rising economic burden of chronic disease. We are leading the way with clinical research that the government or private foundations are often unwilling to fund. We have accomplished much to date, but we need your help to go further. The IRF is a Massachusetts nonprofit public benefit corporation (EIN 41-6518089) and a recognized entity that is tax-exempt under Section 501(c)(3) of the International Revenue Code. To provide support for clinical research projects for the use of innovative nutritional approaches to reduce inflammation that is the underlying cause of many chronic disease conditions. More than 40 years ago I realized the future of medicine did not lie with developing new magic bullets for any particular disease but developing an overall dietary program to keep inflammation in a zone. This would allow us to generate enough of an inflammatory response to defend ourselves against microbial invasion and help heal our injuries, yet at the same time prevent excess inflammation from attacking our organs, leading to the development chronic disease at an earlier age. Although our understanding of the power of anti-inflammatory nutrition to affect our hormones and the expression of our genes has dramatically increased, the communication of that knowledge to the general medical establishment and the lay public has been lagging. There are actually two phases of inflammation. The first phase is the initiation phase that causes the heat, pain, swelling, and redness associated with inflammation described in ancient times. However, there is a second phase called the resolution phase that reverses the initiation phase and allows tissue regeneration. As long as these two phases of inflammation are balanced, this becomes the molecular definition of wellness. If either phase is unbalanced, then we generate a state of low-level chronic inflammation that ultimately leads to loss of function. This inability to manage chronic inflammation can be viewed as a molecular definition of aging. 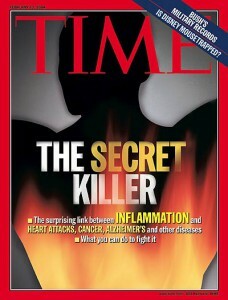 Although Time magazine ran as its cover story “The Secret Killer: The Role of Inflammation in Heart Disease, Cancer, Alzheimer’s and other Chronic Diseases” in 2004, little has been done to reverse these ongoing epidemics that are driven by inflammation, such as obesity, diabetes, heart disease, cancer or Alzheimer’s. This inability to manage of chronic inflammation was the reason for the founding of the Foundation in 2003. Understanding the role of nutrients and their impact on hormonal responses and gene transcription factors that control inflammatory response is the core of anti-inflammatory nutrition. At the IRF, we are focused on three areas of anti-inflammatory nutrition. Impact of dietary polyphenols on gut microbes and gene expression. All of these chronic diseases have a strong inflammatory linkage, and the IRF believes our clinical research can demonstrate the efficacy of anti-inflammatory nutrition in the management of these inflammatory conditions. Provided is published IRF-Supported Research to date, with topics such as omega-3 fatty acids, the role of anti-inflammatory nutrition, and polyphenols in the management of chronic disease. Bell, S.J. and Sears, B. “Low-glycemic load diets: Impact on obesity and chronic diseases.” Crit Rev Food Sci and Nutr 43: 357-377 (2003). Bell SJ and Sears B. “A Proposal for a New National Diet: A Low Glycemic- Load Diet with a Unique Macronutrient Composition.” Metabol Synd and Related Disord 1:199-208 (2003). Bell SJ and Sears B. “The Zone Diet: An Anti-Inflammatory, Low Glycemic-Load Diet.” Metabol Synd and Related Disord 2:24-38 (2004). Johnston CS, Tjonn SL, Swan PD, White A, and Sears B. “Low-carbohydrate, high-protein diets that restrict potassium-rich fruits and vegetables promote calciuria.” Osteoporos Int 17: 1820-1821 (2006). Johnston, CS, White AM, Tjonn, S, Swan PD, Hutchins H, and Sears B. “Ketogenic low-carbohydrate diets have no metabolic advantage over nonketogenic low-carbohydrate diets.” Am J Clin Nutr 85: 239 (2007). Sorgi PJ, Hallowell EM, Hutchins HL, and Sears B. “Effects of an open-label pilot study with high-dose EPA/DHA concentrates on plasma phospholipids and behavior in children with attention deficit hyperactivity disorder.” Nutr J 13:16 (2007). White AM, Johnston CS, Swan PD, Tjonn SL, and Sears B. “Blood ketones are directly related to fatigue and perceived effort during exercise in overweight adults adhering to low-carbohydrate diets for weight loss: A pilot study.” J Am Diet Assoc 107: 1792-1796 (2007). Sears B. “Anti-inflammatory diets for obesity and diabetes.” J Coll Amer Nutr 28: 482S-491S (2009). Mills JD, Bailes JE, Sedney CL, Hutchins H, and Sears B. “Omega-3 dietary supplementation reduces traumatic axonal injury in a rodent head injury model.” J Neurosurgery 114: 77-84 (2011). Sears B and Ricordi C. “Anti-inflammatory nutrition as a pharmacological approach to treat obesity.” J Obesity 2011: 431985 (2011). Sears B and Ricordi C. “Role of fatty acids and polyphenols in inflammatory gene transcription and their impact on obesity, metabolic syndrome, and diabetes.” Eur Rev Med Pharmacol Sci 16: 1137-1154 (2012). Lotrich, FE, Sears, B, and McNamara RK. “Elevated ratio of arachidonic acid to long-chain omega-3 fatty acids predicts depression development following interferon- alpha treatment: Relationship with interleukin-6.” Brain, Behavior, and Immunity 31: 48-53 (2013). Sears B, Bailes J, and Asselin B. “Therapeutic uses of high-dose omega-3 fatty acids to treat comatose patients with severe brain injury.” PharmaNutrition 1: 86-89 (2013). Lotrich FE, Sears B, and McNamara R.K. “Anger induced by interferon-alpha is moderated by ratio of arachidonic acid to omega-3 fatty acids.” J Psychosomatic Res 75:475-483 (2013). McNamara RK, Perry M, and Sears, B. “Dissociation of C-reactive protein levels from long-chain omega-3 fatty acid status and anti-depressant response in adolescents with major depressive disorder: an open-label dose-ranging trial.” J Nutr Therapeutics 2:235-243 (2013). Georgiou T, Neokleous A, Nikolaou D, and Sears B. “Pilot study for treating dry age-related macular degeneration (AMD) with high-dose omega-3 fatty acids.” PharmaNutrition 2:8-11 (2014). Sears B and Perry M. “The role of fatty acids in insulin resistance.” Lipids Health Disease. 14:121 (2015). Sears B. “Anti-inflammatory diets.” J Am Coll Nutr 34: Suppl 1 14-21 (2015). Lotrich FE, Sears B, and McNamara RK. “Polyunsaturated fatty acids moderate the effect of poor sleep on depression risk.” Prostaglandins Leukot Fatty Acids 106: 19-25 (2016). Contribute toward the Inflammation Research Foundation and help change the world. All donations acknowledge that the donor has imposed no restrictions on IRF use of such gifted funds, and that IRF provided no goods or services in return for the donation. 100% of all donations support clinical research costs incurred by Dr. Barry Sears and his associates to conduct crucial research. Via Phone – Call us at (781) 639-1214, Monday through Friday, 9AM-7PM EST.